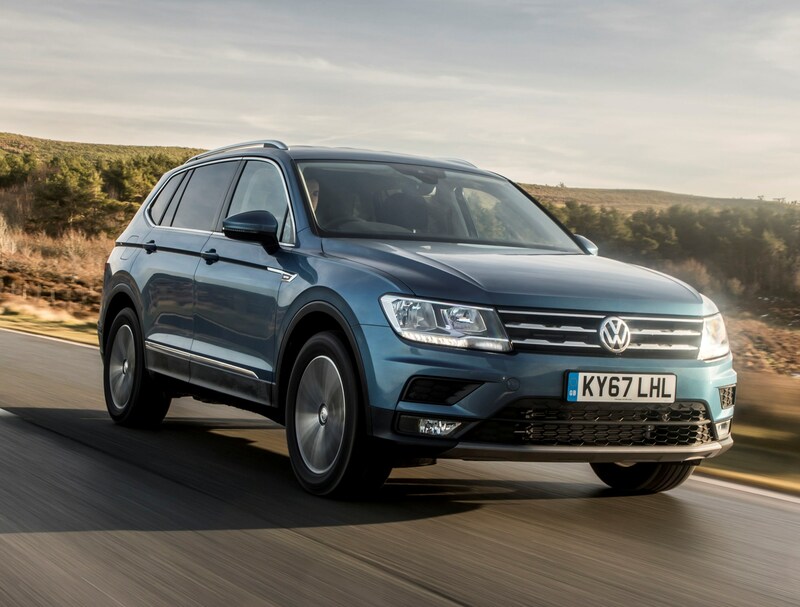 The Tiguan mid-sized SUV is Volkswagen third best selling model range in the UK behind the Golf and Polo hatchbacks. The five seater Tiguan and the larger seven seat Tiguan Allspace form the meat in the VW sandwich of their ever extending range of SUVs. Globally over five million Tiguans have been sold in the model’s 11 year history. Top layer of the VW SUV range is the large and heavyweight Touareg with its 3.0 litre V6 TDI engine power with 4Motion traction. Moving in a downwards direction is the Tiguan Allspace, the Tiguan, the T-Roc and arriving soon is the even smaller T-Cross. 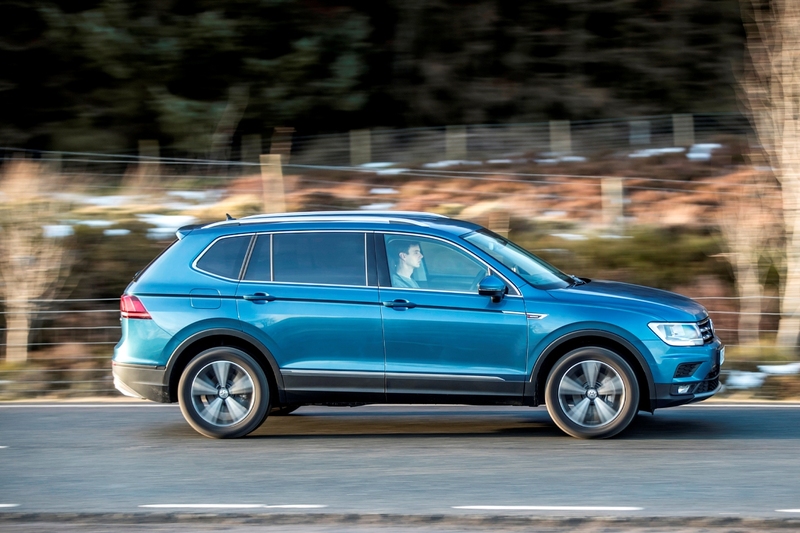 SUVs or 4x4s account for more than one in three new cars sold in the UK and Europe, so Volkswagen seems to have the entire size menu covered with their multiple ranges, and on this occasion it’s the 2019 model year Tiguan Allspace we are putting through its paces. 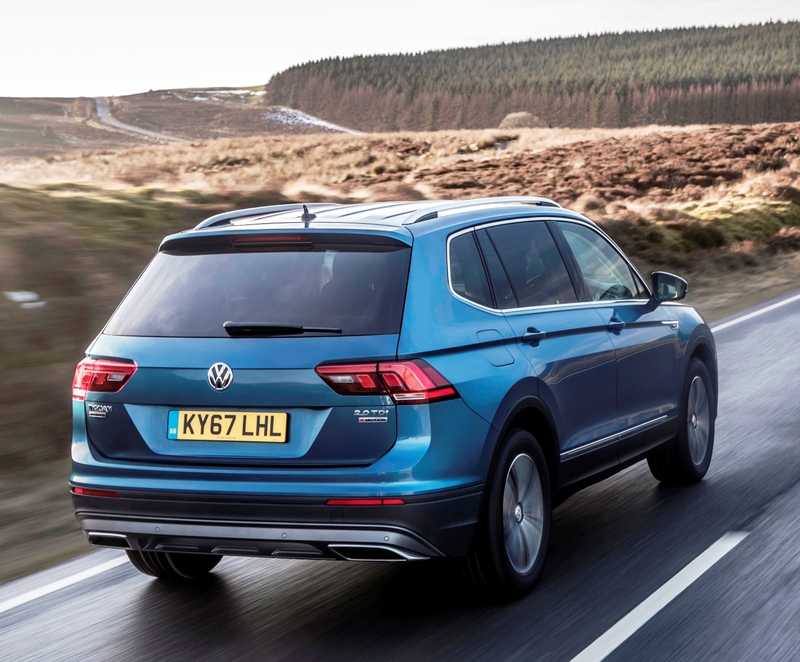 Following recent specification and engine changes the 2019 Tiguan five seat range prices start from £23,990 and rise to £40,955 with petrol, diesel, manual, automatic and 2WD or 4WD variations to choose from, and a wide range of spec levels. The Tiguan Allspace latest range is priced from £29,515 and rises to £43,205. The clue as to what this model range is all about comes from its name – Allspace. and add in Tiguan we can take for granted it’s an SUV with a versatile roomy seven seat interior, or if you prefer fold down the rear or second rows of seats to provide a combination of passenger and load carrying combinations. Like the ‘classic’ Tiguan, the new Tiguan Allspace is built on Volkswagen’s MQB highly rated modular platform. The Allspace has a wheelbase 109 mm (4.29 in) longer than the Tiguan as it increases from 2,681 mm (8.80 ft) to 2,787 mm (9.14 ft). This leads to a total vehicle length of 4,701 mm (15.42 ft), which is an increase of 215 mm (8.46 in) over the Tiguan. The resulting interior volume provides the room for more luggage and a third row of seats. The rear two individual seats, say VW, are suited to people up to five feet two inches tall and in the UK they are included as standard. Five adults and their luggage can fit comfortably in the car. With five seats occupied in the first two rows there is up to 700 litres (24.72 cu.ft) of luggage space (Tiguan: 615 litres (21.72 cu.ft). With the middle and rear rows of seats folded down the luggage space increases to a total of 1,775 litres (62.68 cu.ft), which means items such as sports equipment can be loaded into the rear of the car. With all seven seats in place the boot still measures 230 litres (8.12 cu.ft) and for good measure all versions have an electronically operated tailgate. The exterior styling of the Allspace is more or less a repeat of that used for the Tiguan models but with different proportions and of course the extra wheelbase and body length. The radiator grille is higher, the grille is more upright and the bonnet carries different accent lines from front to rear. The rear side doors are longer to provide easier access to the third row of seats and there is a sharper upwards curve for the rear side windows behind the C-pillar. The roof is of course elongated with a flowing semi-coupé side profile, but that design of course restricts adult passenger headroom in the two rearward seats. Headroom and legroom throughout the rest of the vehicle is very good so should it be called the ‘All-but-rear space’ instead of Allspace? Upfront the cockpit and front seats layout is the same as with the regular Tiguan, well placed easy and logical switches and controls, the usual centrally positioned touchscreen that provides access to sat/nav, DAB radio and a host of other functions but gladly the vehicle has separate heating, ventilation and air distribution controls plus independent front heated seats buttons. The lower centre console leading from the dashboard to the front seats houses the gear shift lever, electronic parking brake and the rotary controller for the various modes offered by the 4Motion traction system. The centre button in the rotary controller is used to select one of several performance modes. The equipment, driving safety support and connectivity specification is fully comprehensive on the SEL version I tested. For good measure this version has a 10.3-inch Active Info Display screen in the instrument binnacle, which can be adjusted to provide various displays of instruments and driving information. This is in addition to the 8.0-inch centrally positioned touchscreen. LED lighting front and rear and 19-inch alloy wheels are also included with this spec level. 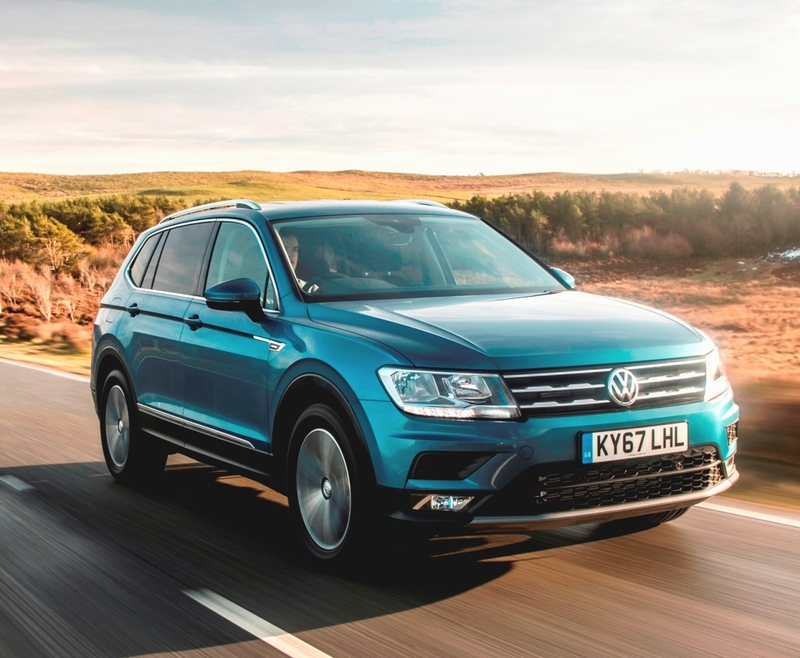 My Tiguan Allspace test drive model was the SEL 2.0-litre 190 hp TDI with a seven speed DSG auto gearbox and 4Motion traction, priced at £38,725. If you were thinking of adding any extra cost options you would be very close to breaking the £40k on-the-road price barrier which would mean an extra £310 of VED Standard rate road tax for five years from year two onwards. The CO2 emissions are 147 g/km so the new VED road tax costs from April this year are £530 followed by the new Standard rate of £145. Just under half of Allspace UK sales go to business/fleet customer, the majority will be diesel powered models so the new Benefit-in-Kind tax level is 37%. Insurance is Group 23E and warranty is the usual VW Group of brands ungenerous three years/60,000 miles cover. Whilst the 2.0 litre TDI 150 hp is the mainstay workhorse diesel engine in the range, the 190 hp version of the same capacity unit just adds that bit more power and torque if the vehicle is going to be used loaded or for towing on a regular basis. It just gives that bit more ‘muscle’ but I think with a marginal loss in refinement. It’s noisier and the diesel ‘clatter’ is noticeable on start up from cold and at tickover. Once underway the noise drifts away and the driving experience is more refined. This unit delivers a hefty 400 Nm (295 lb.ft) of torque from 1,900 rpm and that suits the slick and smooth changing seven speed auto gearbox ratios very well. Top speed is 130 mph with the zero to 62 mph acceleration time of a usefully short 8.6 seconds. The 2019 new WLTP official Combined Cycle fuel economy figure is 38.7 mpg and that is considerably lower than the previous 2018 model year Combined Cycle figure of 47.9 mpg recorded under the now defunct NEDC testing system. The new WLTP figure was certainly much more accurate as my week of motoring using all types of roads and traffic conditions returned a real-life figure of 39.5 mpg for the week and 44.8 mpg on one long journey – but that was not carrying much weight in terms of passengers. For: Builds on the popularity of the Tiguan family of SUVs, seven seats or variable amounts of load space, well equipped, well made, strong engine, smooth auto gearbox, easy to live with. 2019 Volkswagen Tiguan Allspace SEL 2.0 TDI, 190 hp, seven speed automatic, 4Motion. Engine/transmission: 2.0 litre, four cylinder direct injection turbodiesel with particulate filter and selective catalytic reduction, 190 hp and 400 Nm (195 lb.ft) of torque, seven speed DSG twin clutch automatic, 4Motion on demand all wheel drive. Performance: 130 mph, 0–62 mph 8.6 seconds. Fuel consumption: WLTP Combined Cycle 38.7 mpg (39.5 mpg on test), CO2 147 g/km, new VED First Year road tax £530 then £145 Standard rate, BiK company car tax rate 37%. Insurance Group: 23E. Dimensions/capacities: L 4,701 mm (15.42 ft), W 1,839 mm (6.03 ft), H 1,674 mm (5.49 ft), wheelbase 2,787 mm (9.14 ft), boot/load space 230 to 1,775 litres (8.12 to 62.68 cu.ft), braked towing weight 2,400 kg (5,291 lb), five doors/seven seats.